As the deluge of Christmas catalogs begins arriving in the mailbox, one I always look forward to is the Orvis Dog Book with its comfy dog beds, great toys, and fashionable yet practical dog accessories. No foo-foo stuff, but just the thing for a sporting breed like Alex the Welsh Springer. The wonderful folks at the Morris Animal Foundation have teamed up with Orvis in a photo contest to pick the Fall 2010 cover dog photo. Your dog could be the top model! 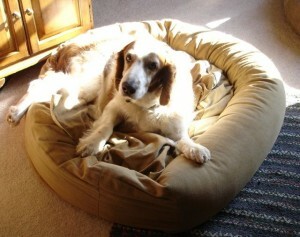 MAF has teamed with Orvis and Eukanuba to help find a cure for canine cancer through Orvis’s annual photo contest. 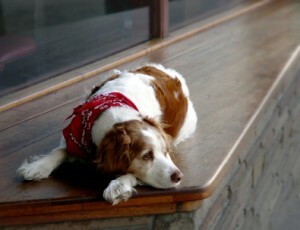 Submit photos of your favorite canine at http://www.orvis.com/coverdog by Jan. 24, 2010. The winning photograph will grace the cover of the fall 2010 Orvis Dog Book, and the winning photographer will win a $500 Orvis gift card. Vote for your favorite dog for just $1 per vote, with all voting proceeds going toward MAF’s Canine Cancer Campaign. Orvis and Eukanuba, together, will match your contribution up to $30,000. So, every vote you cast becomes $2 toward research to prevent, treat and cure canine cancer. At Alex’s annual checkup this week, the veterinarian recommended vaccinating him for dog influenza, a respiratory virus that spreads quickly among dogs in places such as daycare, boarding kennels, dog parks, or dog shows. The virus was first discovered among greyhounds at Florida dog tracks, and has since spread to 30 states. Symptoms include sudden lethargy, high fever and nasal discharge, and can lead to pneumonia. Although most dogs respond quickly to antibiotics, the virus can be fatal. The vaccine involves two shots, two to three weeks apart, with yearly booster. 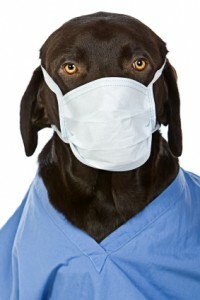 For more information, see the Centers for Disease Control http://www.cdc.gov/flu/canine/ or www.doginfluenza.com.